Tag line: "Feats beyond description! Spectacle beyond imagination!" I wish I'd seen The Magic Sword when I was a kid. 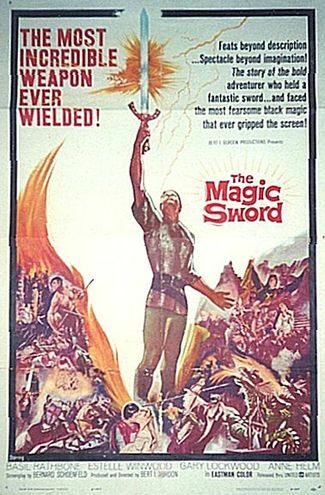 With its tale of knights, dragons, sorcerers, and ogres, this 1962 fantasy is the kind of movie I would have loved back then! Though he has never met her, George (Gary Lockwood) is deeply in love with the Princess Helene (Anne Helm). When she is abducted by the evil sorcerer Lodac (Basil Rathbone), George vows to do whatever is necessary to ensure the Princess’s safe return. Armed with magical weapons (one of which is the titular sword) that he stole from his adoptive mother, the sorceress Sybil (Estelle Winwood); and with the help of six brave knights he rescued from captivity, George sets off for Lodac’s castle, intent on saving the Princess and making her his bride. But the journey will be a perilous one. For starters, George and his men must join forces with the treacherous Sir Branton (Liam Sullivan), who also plans to marry the Princess. Even more dangerous are the seven curses of Lodac, which George and the others have to overcome if they’re to have any chance of rescuing the Princess. Should they fail to reach her in time, the Princess will likely be fed to Lodac’s pet dragon! Bert I. Gordon keeps the story moving, and fills The Magic Sword with one cool bit of fantasy after another. The battle with a giant Ogre (Jack Kosslyn), one of Lodac’s curses, is exciting; and some of what the lead and his knights encounter during their travels is kinda frightening (there’s a hideous old hag played by Vampira herself, Maila Nurmi; and a magical spell of Lodac’s burns the flesh off two of George’s knights). There’s even comic relief, with Estelle Winwood’s somewhat forgetful sorceress doing what she can to help George, but more often than not making a mess of things (Winwood, so funny as one of Max Bialystock’s “customers” in Mel Brooks’ The Producers, plays the part of Sybil wonderfully). Even by today’s standards, the effects look pretty darn convincing (Lodac’s dragon is especially impressive), and the story of good versus evil will surely appeal to viewers of all ages. Whether you’re young or young at heart, The Magic Sword will be well worth your time.